Mandarin collar, double breasted traditional styling. Features: Vent. 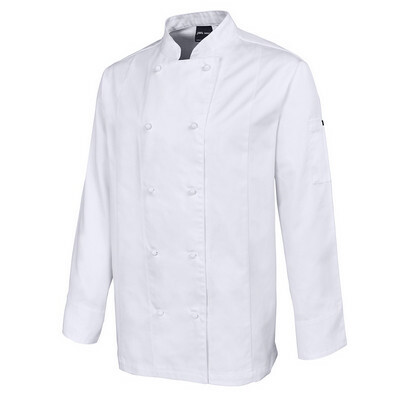 Vented Chef`s Jacket. Detais: 65% Polyester for durability 35% Cotton for Comfort, 190gsm Drill Fabric, Mandarin Collar, Double Breasted, 10 Interchangeable buttons, 2 pen pockets on sleeve, Back yoke with under-layer mesh fabric, Underarm with mesh fabric, Side vents for added comfort. Colours: White | Black. Sizes: S | M | L | XL | 2XL | 3XL | 4XL.